There is serious doubt regarding whether the investigation on unlawful surveillance allegedly involving the presidential secretary for civil affairs can be independent and impartial, since the prosecution department has been instructed by the president’s office to conduct this investigation. In June 2010, it was first known to the public that the unlawful surveillance of civilians as well as at least three legislators and their family members were carried out for some years by the officials of the Prime Minister’s office. This surveillance was carried out under the instructions of the presidential secretary’s office. When this allegation was raised at the National Assembly, due to political pressure the prime minister’s office requested the Prosecutor’s Service to investigate. Materials at the office were seized and confiscated, and three officials were prosecuted for abuse of position on August 11, 2010. Allegations were made that other presidential secretaries, such as of civil affairs and employment and labour were also involved in this unlawful surveillance, but these were not verified in court. According to the Prosecutor General’s testimony at the National Assembly, the failure of verification was due to insufficient evidence as well as statements by the accused. One accused charged with destruction of evidence in the court proceedings recently disclosed to the media that the presidential secretary of civil affairs was involved, who assured him that the prosecutor would prosecute him to the extent that he would still be able to continue his work as a public servant. He also revealed that he was offered money as compensation and forced to not acknowledge the involvement of the presidential secretaries during trial. He claimed that he followed the instructions given him because he regarded them as normal security measures. To support his allegations, the whistleblower provided personal recordings of conversations with officials from the presidential office. It is firmly believed that the prosecution is biased in this case, leading to partial and inadequate investigations. In fact, for 20 days after the allegations of unlawful surveillance were reported, the prosecution took no action, and the seizure and confiscation of materials from the prime minister’s office was done four days after the request for investigation was made. During this time, the whistleblower was given instructions to destroy a hard disk with the relevant information before the prosecutor’s raids took place. It was reported that although the evidence seized and confiscated was little, the prosecutor put it into several boxes filled with newspapers to show the media that a considerable amount of evidence was taken. Although the prosecutor found that an official of the presidential office used a mobile phone registered under another person’s name to avoid having their phone records traced, this was not further investigated and was excluded from evidence submitted before the court. Subsequently, this official was transferred to the Korean Embassy in the United States. A member of parliament later released to the public that while the prosecution was able to recover material from the destroyed hard disk, they did not investigate the material. In such cases of unlawful action where the presidential office or high profile political figures are involved, impartial prosecution is the norm, as decided by the Ministry of Justice through instructions received from the presidential office. Together with the Ministry of Justice, the Prosecutor’s Service decides on selective or no prosecution. After the disclosure of the accused, the Prosecutor’s Service decided to reinvestigate in this case. There remain grave concerns however, that again proper investigation and prosecution will not be done; rather, the investigation will be conducted to the extent that a few secretaries are found responsible for abuse of power, or to the extent that the result of the investigation is not damaging to the current government. One key issue is that the period of unlawful surveillance between 2009 and 2010 overlaps with the period when the incumbent Minister of Justice was the presidential chief secretary for civil affairs at the presidential office. Unless an independent commission of experts completely outside the prosecutor’s service and political interference conducts a thorough investigation, it is highly unlikely for justice to prevail. The lack of independence of the Prosecutor’s Service and its politicisation is another serious problem. Under President Park Chung-Hee in 1967, senior or chief prosecutors did ‘detached service’ at the office of the presidential secretary for civil affairs. During this service, their role was to deliver the message and will of the president to the prosecution department. In other words, that was how the presidential office controlled the prosecution. Since then, the prosecution in South Korea was subordinated to the presidential office and carried out its role as a government tool to suppress opposition and dissidents through the legal actions of investigation and prosecution. As a result of much criticism, the provision that “a public prosecutor shall neither be dispatched to the Office of President nor concurrently take any office thereof” was incorporated into the Public Prosecutor’s Office Act in December 1996. However, the old practice continues today in an alternate form: now, a prosecutor resigns from the Prosecutor’s Service before joining the presidential office, and is reemployed as a prosecutor by the Ministry of Justice once he quits from the presidential office. 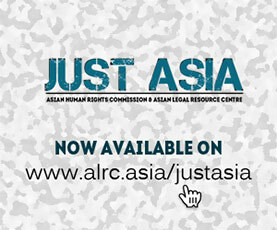 The Asian Human Rights Commission (AHRC) is of the opinion that unless this system is thoroughly reformed, little will change. Biased and impartial investigation as well as unfair prosecution will continue, with junior prosecutors instructed by their politically motivated or influenced seniors. The government has always promoted persons to senior or chief prosecutor positions as reward for their allegiance to those in power. For this reason, it is crucial to establish an independent committee comprising of outside experts to monitor and review all investigation and prosecution. Furthermore, judicial reform can no longer be seen as optional, but shall be a ‘must’ for the promotion and protection of human rights and democracy. Taking into account the high number of cases indicating that those speaking out against injustice are punished through absurd applications of law together with punitive means, the accused in this case should be protected. He should not be discriminated against, and must be entitled to legal advice from his counsel during any interrogation. Furthermore, Mr. Kim Jong-Ik, one of the victims of unlawful surveillance, who was at that time a representative director of a company, and forced to sell all his stocks and resign under the duress by officials at the prime minister’s office should be entitled to an effective remedy.